Word games for kids are fun and they can be enjoyed by the entire family. There are also a great way for kids to develop vocabulary and improve their literacy skills. With word board games such as Scrabble or Bananagrams children acquire new vocabulary and improve their spelling skills. Apples to Apples is a really fun family board game that can be played for hours. This game also received many awards because it is a lot of fun and because it promotes vocabulary development. Sentence building dominoes help kids learn new words and become better at forming sentences and expressing thoughts. They are usually magnetic and be used on the fridge or file cabinet. Check also our reading games and literature books sections for games that help children enhance their literacy. Scrabble Deluxe is a durable Scrabble set with wooden letter tiles and a storage case. A great game that helps players acquire new vocabulary. Scrabble Junior is one of our favorite word board games. It is a fun family board game that helps children enhance their vocabulary and literacy skills. 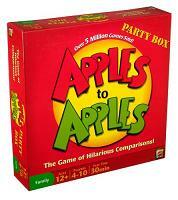 Apples to Apples is an award-winning word board game that is plenty of fun and that encourages vocabulary development. Bananagrams is a very popular word game involving lettered tiles that players have to place into crossword style word arrangements in order to win points. In this junior version of Boggle, children link pictures to words and letters and learn about the letters of the alphabet and the spelling of words. 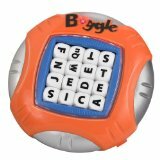 Boggle is a fast-paced word game that uses a timer and a plastic grid. The game helps kids learn new words and improve their spelling. Educational Insights offers educational games for kids including a set of magnetic sentence building dominoes that kids can use to form sentences and improve their spelling. This is the Disney version of the Apples to Apples game and features themes from Disney parks, movies and shows. This is the portable version of the Apples to Apples game, which means it is easy to carry around and play as you are traveling. It also contains 100% news content.